AIT provides the machines and technical support for your Micro Resistance Welding Project. Click Here for Micro Resistance Welding Equipment. Advanced Integrated Technologies ( AIT ) is a provider of micro resistance welders and technical support to companies all over the world. We can evaluate your weld samples, offer free test welds, and specify the optimum equipment for your micro welding project. We also build quality, low cost micro tip electrodes designed to fit any brand of welder you may have. Submit a contact form or call us today for assistance. 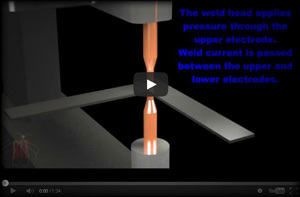 Most spot welding fits into one of three categories. Large scale such as that used in the automotive industry involves welding mostly steel and stainless steel, in the thickness range of .016” to .062” thick. Moving down to small scale spot welding, we find the above mentioned materials plus various alloys like molybdenum, tungsten, inconnel, and nichrome in the range of .005” to .020” thickness. The micro scale of spot welding is the smallest, utilized in high tech industries like electronics, medical, bio implant, and telecommunications devices, with a material range of .0005” to .005” thickness. Several types of welders are capable of micro welding, but the transistor type such as the Avio MCW-700 and MCW-750 are the best for super fine wires and sensitive micro components. The MCW transistor series welders accomplish consistent and precise welding by a high speed linear control, with three control modes: constant current, constant voltage, or constant power. Capacitor discharge and inverter type welders can also be used for somewhat less sensitive micro welding applications. 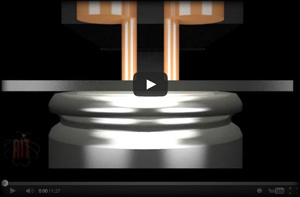 Micro resistance welding applications require very small and precisely built electrodes. Advanced Integrated Technologies ( AIT ) is the industry leading manufacturer of micro electrodes for all makes of welders including Palomar/Hughes, Unitek, Avio, MacGregor, and Sunstone Engineering. Our high tech manufacturing processes help us to build very high quality low cost electrodes. We offer both parallel gap and single point welding electrodes, in all RWMA materials. Our standard product line of welding electrodes covers the vast majority of applications. AIT also builds a wide range of custom electrode designs for many of our customers. If you need micro resistance welding electrodes, call us today and see how Advanced Integrated Technologies ( AIT ) can help you.